Last week, I went back to my chemistry lab days and conducted a little experiment. I purchased a food scale. I don’t use those. Maybe I have a very innate sense of how much I want to eat. But two things I know for sure, weighing my food is not a priority of mine. It shouldn't be one of yours either. Also, our children are watching. In college for one of our community nutrition courses we were assigned a partner. We weighed and measured each other to figure out body fat percentages and to figure out caloric and macronutrient requirements. I was already deep into my major and aiming to become the “healthiest” version of myself, because I was studying to be a nutritional professional after all. We created our own meal plans and were asked to track everything we ate. This was way before MFP (I am getting old). I had to look everything up in a book called Calorie King. Long after the project was over I continued to track and I bumped up my time at the gym. Studying, working out, and perfecting my nutrition were my ultimate priorities. Which I have say as a mom of four sounds kind of nice, ha! It didn’t take long until it hit me that things were getting out of hand. No one thought I had a problem, but I did get comments about looking “skinny” (hate that word) or “good”. I also came to realize that I hadn’t had a period in three months. Long story short, I knew this was not a healthy lifestyle and I pulled myself out of it. And I promised myself I would never obsess over food or exercise again. I only told my mom about this about 6 months ago because really, it wasn’t that big of a deal. It could have, but it wasn’t. Thankfully, my program at USU was very big on Intuitive Eating and my education there really enhanced my love of food. I also worked at an eating disorder recovery retreat center cooking for the girls and educating them on embracing all types of food. It was a very rewarding experience. Yes, macro counting is a meticulous, demanding, restrictive form of eating, it is dieting . You may not think children pick up on these patterns, but they most certainly do (who knows how I'm currently "messing" my kids up). Psychology of Eating listed the top five causes of eating disorders; stress, family origin ("a mother's unhealthy body image & obsession with calorie counting is easily transferred to her daughter), history of abuse, culture, and a call for growth or transformation. Before, anyone gets too defensive know that this is all coming from a place of education and love. Disagreement or differing opinions do not mean hate or judgment. All parents are just doing the best that they can. My heart also goes out to those who are trying to set and achieve goals, who feel like weighing your food is only way to get results. Because if you can't get it exactly right, you aren't getting enough protein or too much fat/carbs. This is not true. I truly believe that you ditching this way of eating to find flexibility with food will bring a sense of peace into your life. But, in case you want to see for yourself - read on. *this is for informational and educational purposes only. Aim to be in touch with you own hunger and fullness cues, don't rely on external factors to tell you how much to eat. I started with chicken. Cooked chicken of course. I always tell people your full hand is about 6 oz (for women) your palm is about 4 oz. I guessed first, and then compared it to my hand that it would be about 4 ½ ounces. Pretty darn close. Now if you think that .2 of an ounce is going to make a difference, by all means keep it up. Let’s say you are “off” of your protein count by .2 of an ounce 3 meals a day for a week. That’s only 4.2 ounces per week. I just don’t see it being that big of a deal. Next up, grapes and strawberries. 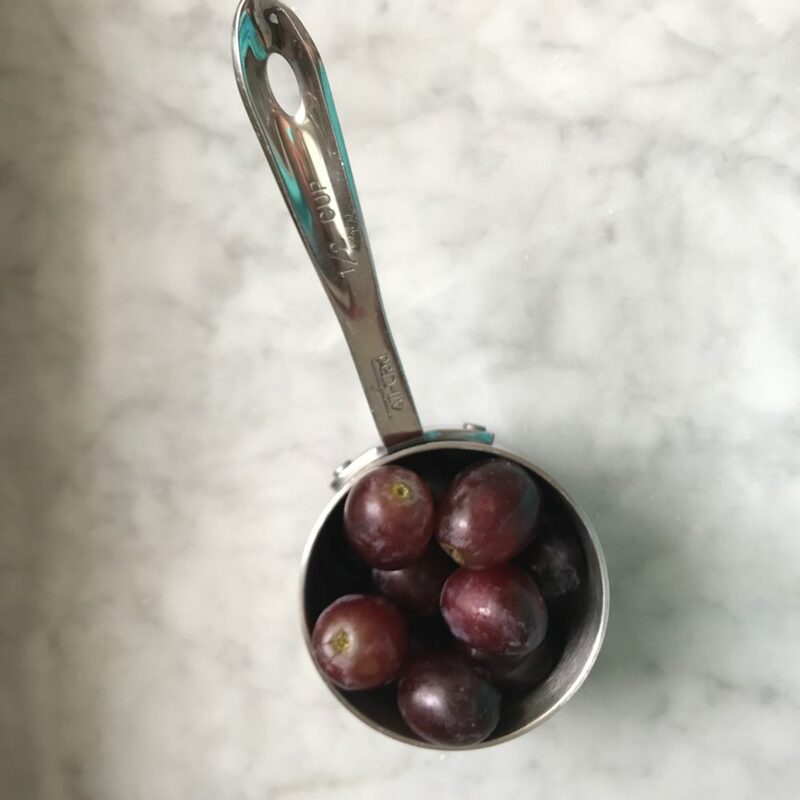 Grapes are higher in carbs than strawberries. 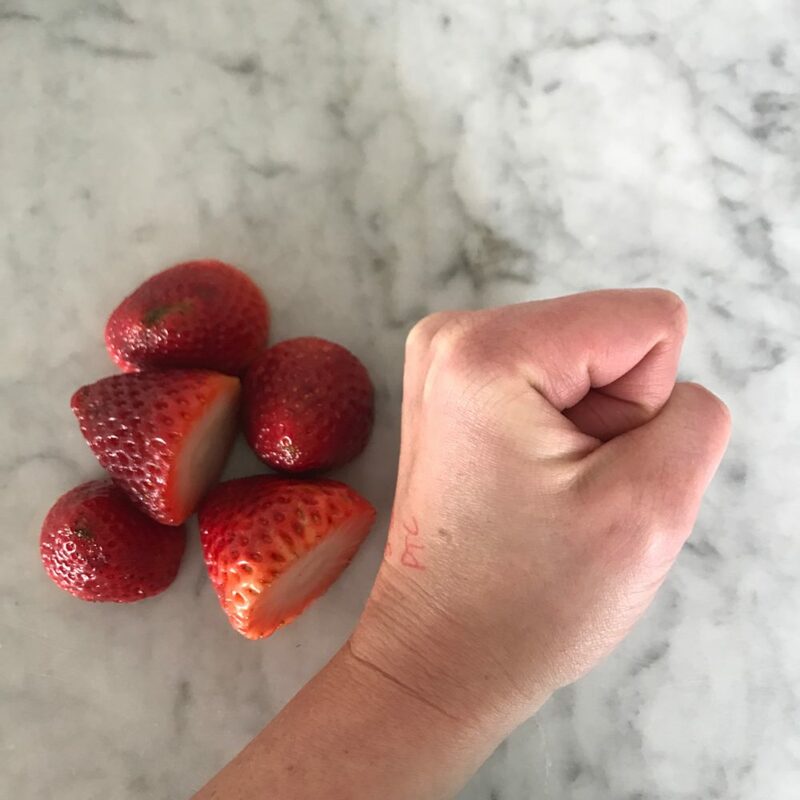 But, strawberries are larger. 1/2 cup fits inside my hand. One cup is about the size of my fist. I measured in my hand first. Then, placed in the cup. Then, on the scale. MFP: 80g = 104 calories, 27g carb; 1/2 cup measured = 72 grams, 93.6 calories, 24.3g carb. 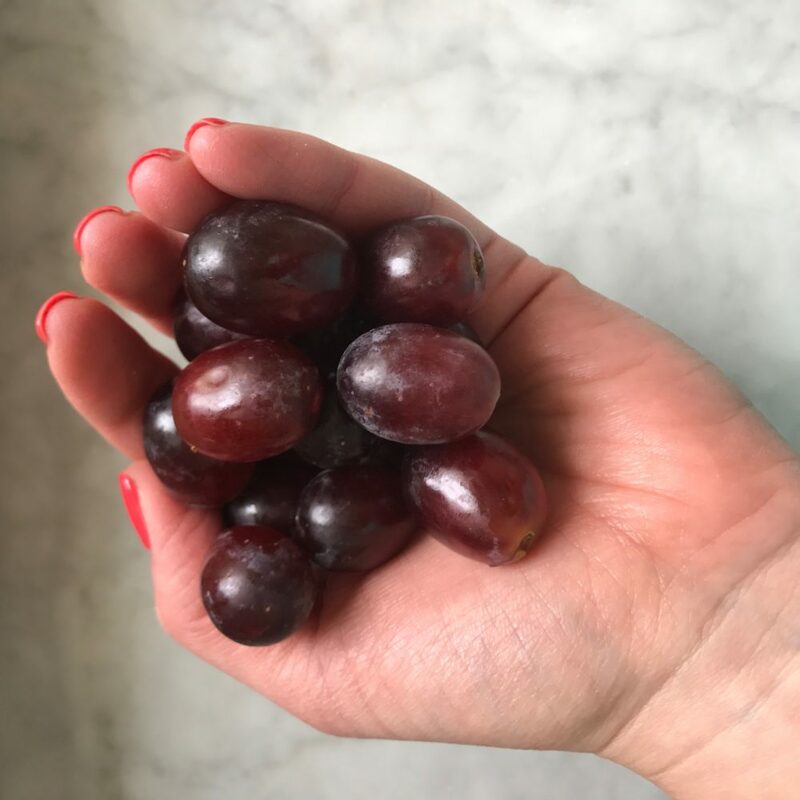 Is the extra time it takes to weigh the grapes worth the 3 grams of carbs? 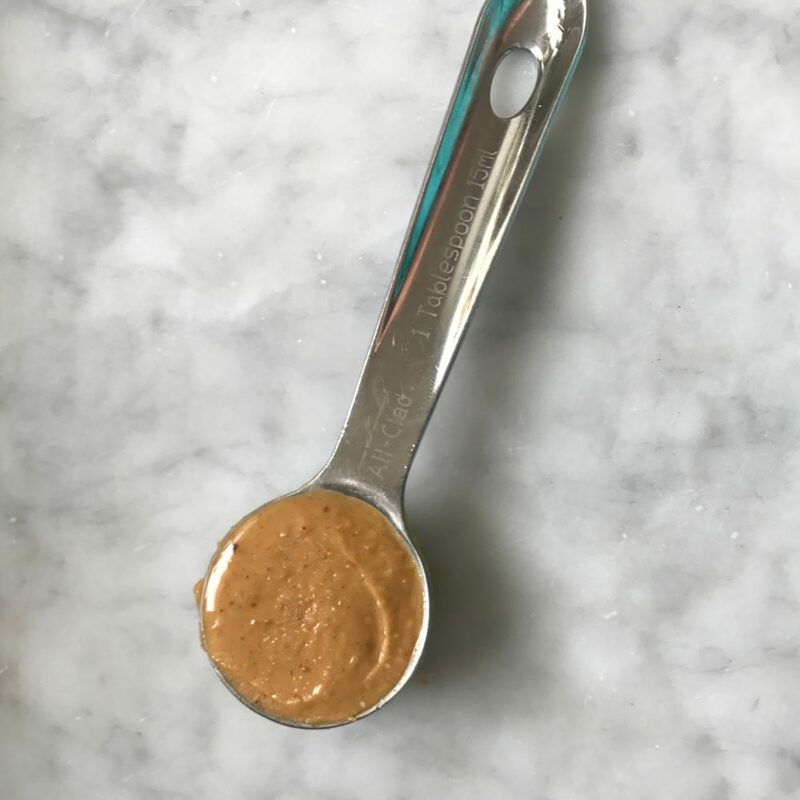 Peanut Butter: Probably the most challenging to weigh on your food scale. I used Adam's Natural. The jar says 1 TBSP is 16 grams. I measured out 1 TBSP, then weighed it, then put it next to my thumb. 1 TBSP weighed was 13 grams. Again, only off by a slight margin of 3 grams. Chances are to get something exact like PB weighed out, you have to spend quite a bit of time to get it right. Salmon: I purchased this pre-cooked at Harmon's and cut a nice perfect square to let it sit on my palm. Weighed out its 3.1 oz. 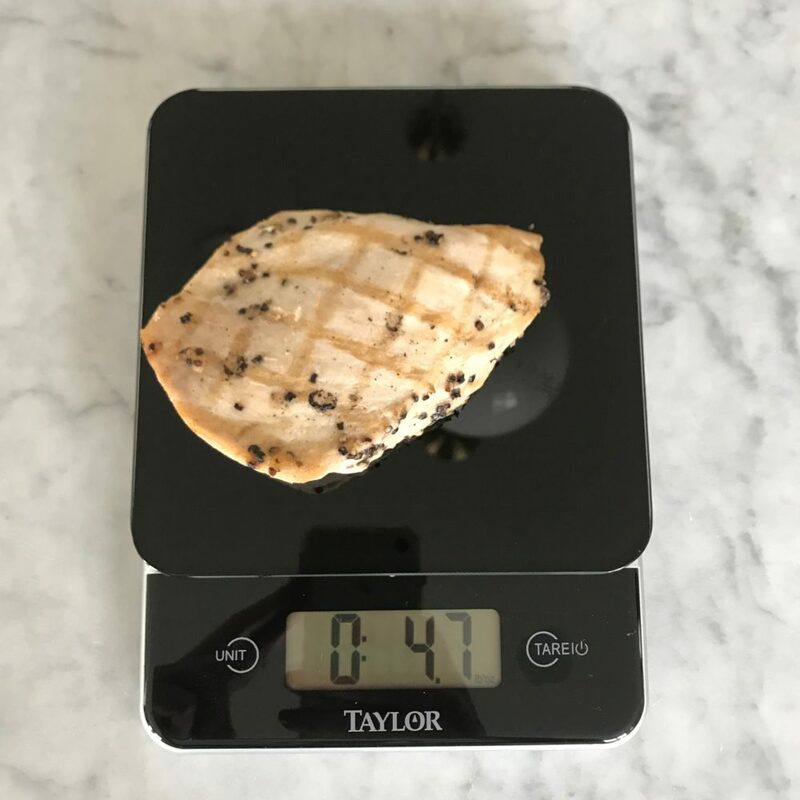 You can see a little less than the 4.7 oz chicken breast. Shredded chicken: I will admit this was the most challenging to weigh because I shred mine in my Kitchen Aid, which adds a lot of volume. 6 oz looks like a ton! But, it still compares to my whole hand. Protein Powder: Now, I've heard this is one the most important items to weigh as the servings size is so off. But, I didn't find that to be the case with Tera's Whey. I did two measurements: 1) a casual scoop like I would normally do 2) a compacted, more level scoop. The serving sizes on the label claims 28 grams per 2 scoops. Again, if one day I measure out 31 grams and the other day I measure out 27 grams when the serving is 28, will it greatly impact my results? Conclusion: The purpose of this experiment was to find out if weighing your food is essential. I never have.